How much does it cost to travel to Puerto Montt? How much money will you need in Puerto Montt? 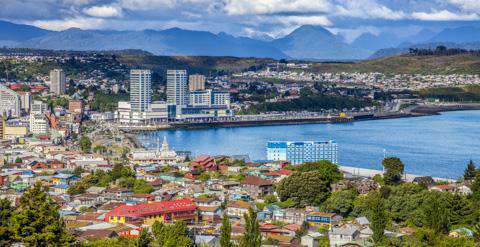 CL$67,904 ($102) is the average daily price for traveling in Puerto Montt. The average price of food for one day is CL$16,259 ($25). The average price of a hotel for a couple is CL$93,145 ($140). Additional pricing is in the table below. These average travel prices have been collected from other travelers to help you plan your own travel budget. How expensive is Puerto Montt? The Lake District is a region of snow capped volcanoes, pale green lakes and endless miles of virgin and ancient forests. Found 1,016 km away from Santiago de Chile, Puerto Montt is famous for its beautiful lakes and its germanic architecture, old wooden houses and its legendary Iglesia Catedral, found on the town's main square, la Plaza de Armas. The monument, entirely built with alerce (cypress) wood, is the oldest building of the city. The capital of the Lake Region is a good starting point for many memorable excursions in the area. Most travellers stop in Puerto Montt because of its close proximity to the Parque Nacional Alerce Andino, the Parque Nacional Vicente Perez Rosales, the town of Puerto Varas as well as Petrohue. The Lago Todos Los Santos, the Volcan Osorno, the Volcan Puntiagudo and the Monte Tronador are well-known sites found in the Parque Nacional Vicente Perez Rosales. Trekking in the park will be a journey full of surprises, as one lake may be hidden by another. The Sendero Los Alerces, which continues on to the Sendero La Picada will bring you to a spectacular viewpoint on the park's lakes and volcanoes including the Volcan Osorno. Buses leave regularly from Puerto Varas to the park. Do not miss the Saltos del Petrohue waterfalls (USD$2.30 entry fee), found 6 km away from the entry of Petrohue, a small town where you will find the pier for Cruce de Lagos boats going to Peulla. For ski lovers, the Centro de Ski y Montaña Volcan Osorno in Ensenada offers ski and snowboard equipment rentals and a pass for half a day (USD$30) or a full day (USD$38) of unlimited ski lift access. During off-season, the ski lift (USD$22) can be taken to reach a few trekking paths with spectacular views. You can access the ski station from Ensenada by bus or with your car, taking the road Ensenada-Puerto Octay until you reach a sign about 3 km away from Ensenada, indicating you to turn right and continue for 10 km on a dirt road. If you call a day before, you can spend a night at the bottom of the slopes in the Refugio Teski (USD$19-24 for a bed in a dormitory or USD$55 for a bedroom or USD$74 for a bedroom with private bathroom), where you can relax in a hot bath in the mountain (USD$63 to rent a bath with appetizers and a pisco sour cocktail) or enjoy the 2 drinks for 1 at happy hour. There is an absolute feast of activities that can be done while you are in Puerto Montt. You can easily move around the city by using the colectivos (city bus USD$1 per ride). Do not miss a visit to the Casa del Arte Diego Rivera (opened from 9h to 13h and from 15h to 18h30 from Monday to Friday), a museum presenting Hardy Wistuba's work as well as other local artists (painters, photographs and sculptors). The Museo Juan Pablo II (opened Monday to Friday from 10h to 13h and 14h30 to 18h), east of the city's bus terminal, is also interesting for those who want to know more about the region. It has a collection of crafts and relics from the nearby archipelago of Chiloe. Historical photos of Puerto Montt give a sense of the area's slow and often difficult growth, as well as the impact of the 1960 earthquake, which virtually destroyed the port. For walkers and outdoor activity fans there really is very little to fault this stunning region. While you are in the Chilean Lake District, you must also try one of the many legendary water sport activities of the region. Only 23 km away from Puerto Montt and surrounded by the Osorno and Calbuco volcanoes as well as the impressive Llanquihue lake, is the charming town of Puerto Varas. In terms of landscape, accommodation and activities, Puerto Varas is well served! Kayak, paddle, canyoning, rock climbing, trekking, ski, fishing, you name it! In Puerto Varas, you can also visit the Paseo Patrimonial, a pedestrian tour across 10 houses classified as national monuments. If none of these water sports tempts you and if you have time, we recommend that you make a little detour to the Cochamo and Rio Puelo Valley. While this area is not very well known among tourist, agencies such as Secret Patagonia or Campo Aventura organizes excursions on horses, mountain bikes or by foot to discover the beautiful valley. You may even end up spending a night in the heart of the forest at Domo Camp (USD$78 for a cabaña) or simply stop there for a delicious lunch. Puerto Montt is Chile's seafood capital. If you're feeling adventurous, try a Chilean favorite, such as abalone, sea urchin, or the regional barnacle. Dive into the chaotic but somewhat wonderful fish market of Angelmo or stop in one of the restaurants along the Avenida Angelmo to eat delicious seafood. The artisanal objects market is found 3 km west of the city center towards the fishing harbor of Puerto Montt. The market is opened every day from 10h to 20h during summer, and until 18h during winter. Puerto Montt also offers a handful of inexpensive cafes in which have lunches, empanadas, and appetizer platters but also German pastries and beer from microbreweries due to the German colonisation of the city in 1845. Other than Santiago, Puerto Montt is the main gateway for air, land, and sea connections to Chilean Patagonia and across the Andes to Argentina. Indeed, you can travel to Puerto Montt by plane, mostly with Latam to the nearest airport, El Tepual de Puerto Montt. Many travellers opt to rent a car as this gives you far more scope for exploration of your own. You can also easily travel through the region by bus. Services are frequent to rural, regional, and most long-distance destinations, as well as to Bariloche, Argentina. Buses to the Chilean Patagonia destinations of Coyhaique and Punta Arenas, which pass through Argentina, are less frequent but reliable. Note that if you decide to go into Argentinean Patagonia with a car, you will need a notarial permission to bring your vehicle into the country. Puerto Montt is also the main departure port for Patagonia. At the port, you can find ticket offices and waiting lounges for both Navimag and Naviera Austral. From Puerto Montt there are passenger and passenger/vehicle ferries or bus-ferry combinations to Chiloe, Chaiten and Puerto Natales.